Would I Inspire Me? 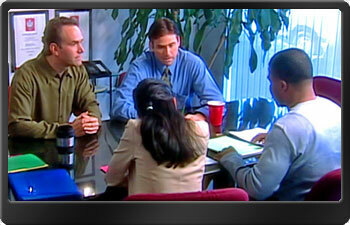 gives viewers practical ways to make work life more meaningful, productive, and rewarding for themselves and their team. The perfect follow-up to Would I Follow Me? What does it take to inspire a work group to greater commitment and productivity? It’s not charisma. Rather, it’s behaviour that any well-intentioned leader can emulate, as this program demonstrates. This video follows Tom, a competent manager, on his quest to find out what makes Elliot, an exceptional manager in his organization, so inspiring to his workers. He learns that Elliot found what was meaningful in their work, and communicated that – in words and actions – to everyone on his team. Would I Inspire Me? gives viewers practical ways to make work life more meaningful, productive, and rewarding for themselves and their team. Ideal training for managers, supervisors, team leaders and newly appointed leaders. Est-ce que je me respecterais?